ETS Solutions manufactures a wide range of vibration testing systems with output force from 2 kgf to 70,000 kgf. All systems are designed to meet the requirements of endurance testing and offer superior performance as well as reliability. Excellent all-round vibration testing capabilities, with systems that comply with international standards including MIL, ASTM, IEC, ISO, BS etc. With a wide range of standard and optional fittings, there is sure to be a solution for every individual’s needs. With our wealth of technical expertise, our team of engineers is able to specially tailor solutions in the event that a standard solution is not available. We provide solutions as diverse as laboratory testing, modal and structural analysis, squeak and rattle, packaging testing, stress testing and dynamic testing. Markets include Automotive and Locomotive, Aerospace, Defense and Consumer Electronics. The VT & MS Series applications include modal and structural analysis to measure vibration response of a wide-range of structures in both defence and civil engineering. VT & MS Series shakers can also be used to test fatigue life and vibration influences on small electric and mechanical components or devices. In addition, they are often used for the calibration of accelerometers and field vibration measurement systems. The ‘M’ Series also meets typical vibration test requirements of other medium to large sized electronic assemblies, automotive parts, aviation and avionics parts. The ‘M’ Series is designed to meet military and international test standards including MIL, ASTM, IEC, ISO, BS and JIS. A wide diameter armature with high cross axial stiffness will allow for using a proportioned head expander to test multiple specimens simultaneously yet achieving good vibration transmissibility ratio. Other test requirements including transportation vibration simulation combined vibration-climatic test and seismic simulations for small size components can be easily fulfilled by the “M” Series. The Long-Stroke Series vibration testing systems are designed for long stroke displacement test requirements normally performed by hydraulic shakers. 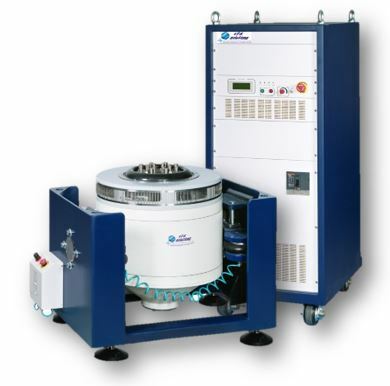 Compared to a hydraulic shaker where maximum test frequency is typically around 400 Hz. The Long-Stroke Series is capable to testing up to 2,700 Hz with a maximum of 100 g (bare table) bounded by 1.8 m/s maximum velocity. This provides users time and cost savings for wide test requirements. These shakers are suitable for testing applications such as package testing and vehicle testing. The Permanent Magnet vibration testing systems are designed for modal and structural analysis, and small components testing. These shakers are typically used in laboratory experiments, modal studies and researches. It can be applied to measure vibration response for a wide range of structures in both defence and civil engineering. It also can be used as a vibration table to test fatigue life and vibration influences for small electric and mechanical components or devices. In addition it is often used for field calibrations of vibration measurement systems. Complete portfolio solution for noise and vibration testing can be offered with the Siemens LMS or ETS Solutions vibration control system. We can offer entry-level vibration control system till high-end control system. The control system will combine optimal ease of use with the performance and reliability of an advanced system. The system offers accurate closed-loop shaker control and a maximum of built-in safety mechanisms, which minimize the risks of damaging costly test items. User guidance and secure automation capabilities deliver maximum productivity and enable testing teams to meet critical deadlines.